When I was approached by the folks from Nuffnang to visit Arintji, I wasn't quite sure what to expect. I used to visit Federation Square quite often when it first opened, for drinks, cultural festivals and meals. That was 8 years ago, however - and just typing that makes me feel so very old! These days, apart from the odd film festival or exhibition, I don't find myself down at Fed Square too often, and haven't been keeping up with the changes. I think this may have been a good thing, as I didn't come to the restaurant with any preconceptions of what it should be like. We visited Arintji last week on Friday evening. After an extremely gruelling week, (which involved heaps of late-night meetings), you can't imagine how happy I was to cast off the shackles, and step into the warm and welcoming restaurant. 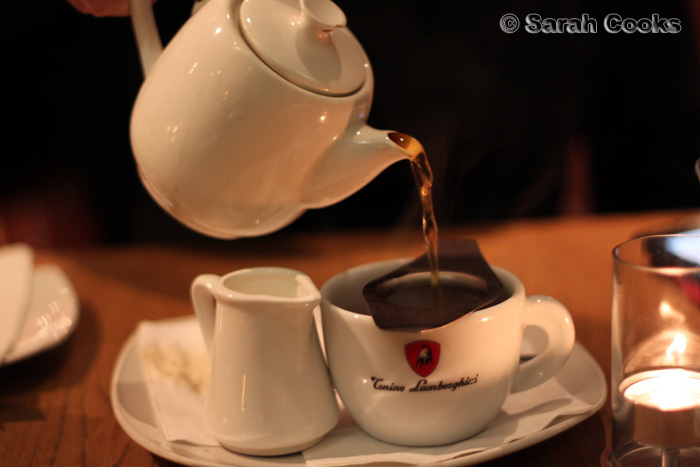 Over the night, it was pleasantly busy, without being noisy or overcrowded. And a sweet wine for Sandra (of course). 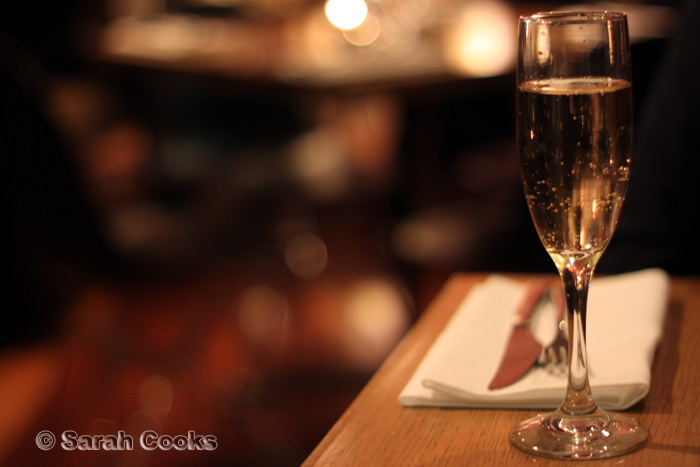 The wine list is reasonably extensive and well priced, with a strong focus on Australian and New Zealand wines. The majority of bottles cost between $50 - $70, with a couple of premium wines at over $100. Importantly, they offer a good selection of wines by the glass! Perfect for me, as I would struggle to finish a whole bottle of wine over dinner, and I like to try different ones. The menu is designed for sharing, and is divided into 3 sections: Food with Drinks, Food with Friends, and Food for After. I'll go through each of these sections in turn. The items under Food for Drinks are priced from $3 (for a single oyster) to $8.50 for a more substantial eat, and include items such as grilled chorizo, salt cod fritters with saffron aioli and a gorgonzola and leek tart. 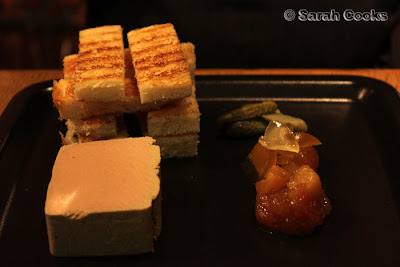 To start, we ordered a beef burger and some duck-liver parfait. The parfait was actually from a separate specials menu. I hope it stays on for a while, because I quite enjoyed it! The beef burger was a cute little patty, wodged between soft buns, with lettuce, cheese and relish. I thought the little jenga-tower of brioche sticks was very cute, although there was way too much parfait for them to accomodate. The condiments on the side were little cornichons, mustard fruits, and an apple-and-pear chutney. I particularly liked the sweetness of that chutney against the creamy and smooth parfait. Food with Friends - These meals are entrée sized and designed to be shared. You can choose any 2 items for $35, or 3 for $50. Between 2 of us, we ordered 2 items, which I felt was a good amount. Your own appetite may be more or less voracious than mine. This part of the menu is quite varied, with items such as smoked duck breast, pickled cherries, sweet potato and frisee; chicken wings with spiced salt, chilli and mint; and terrine of wild and farmed mushrooms with braised shallots. I think we played it quite safe, with a steak and some stuffed calamari. 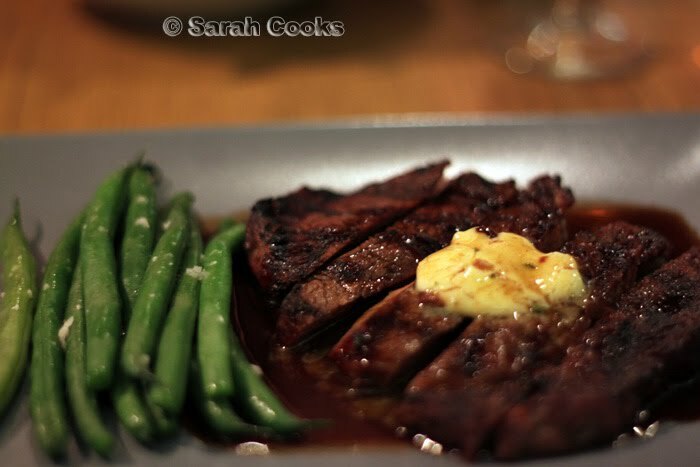 This was a good steak, tastily charred on the outside, and quite tender, even though we had it well-done. (Sandra's request, not mine!) The accompanying beans were crispy and fresh. 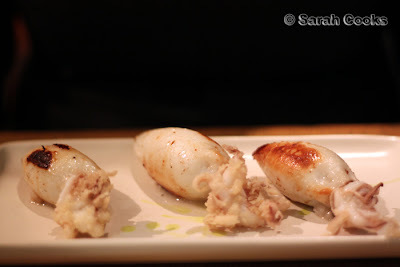 The 3 little calamari were stuffed with a soupy rice mixture - somewhere between a risotto and congee - and was studded with sharp preserved lemon and sweet currants. Whilst the calamari were fresh and well-cooked, I found the stuffing very salty for my taste. I much preferred the steak! Sides are priced separately, and based on what we ordered, I'd definitely recommend getting a side with your meal. This salad is a classic combo, and I found it a nice refreshing counterpoint to the richer food we'd eaten. 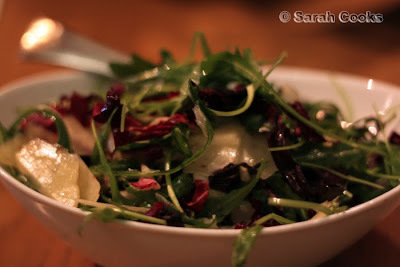 I also liked that the radicchio had been shredded finely, so that its bitterness was not overpowering. 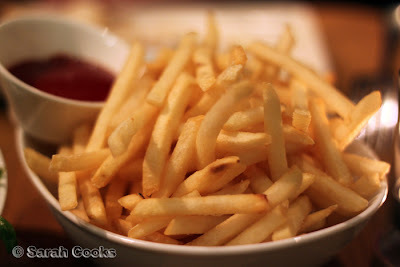 Fries were crispy, hot and fried in fresh oil! I know it seems odd to critique French fries, but so many places get it wrong! And it is so disappointing when you get a bowl of poorly cooked chips. These, however, were fantastic. A little rest... and then it was on to dessert, or as they call it at Arintji, Food for After. Much like the Food with Friends, the desserts are designed for sharing. You can get a choice of 2 for $15, or 4 for $28. Again, I'd go for 2 desserts between 2 people, but the 2 ladies sitting next to us shared 4 between them. Well done! 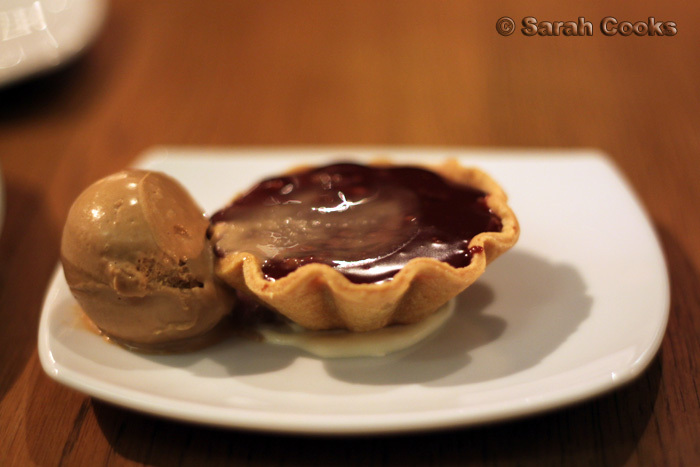 When I saw "milk chocolate" on the menu, I just had to order the tart. I don't quite understand why foodies go crazy for very dark chocolate, when milk chocolate just tastes so good! The scoop of coffee ice-cream slid off the tart as it was placed on our table, but tasted no less delicious for it. 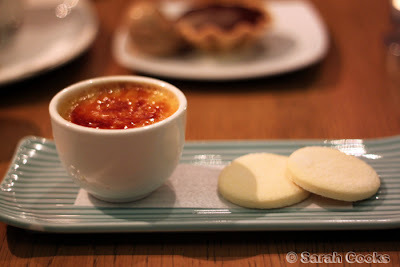 The tart was made of a short and crumbly pastry, filled with a rich milk-chocolate ganache. Quite intense on its own, but the strong coffee ice-cream really cut through the richness. The brûlée was covered with a thin and crispy sugar topping, revealing a creamy, vanilla-flecked custard below. A good version of a ubiquitous dessert. Being an absolute biscuit-fiend, I loved the addition of shortbread cookies! 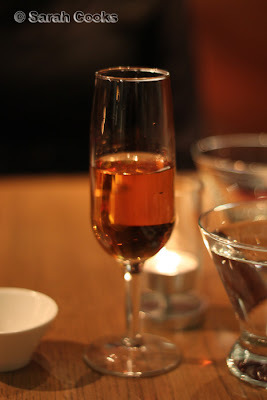 We had a lovely time at Arintji, and given its central location, it would make a great spot for after-work drinks, a pre-theatre dinner, or even a mid-week meal. Based on what we had, the sharing items under Food with Friends can vary a lot in size, so value-for-money would really depend on what you order. 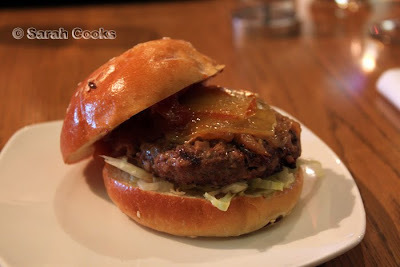 The food is, overall, well executed without being too adventurous, which I think is important for a menu that is designed to be shared amongst a group. 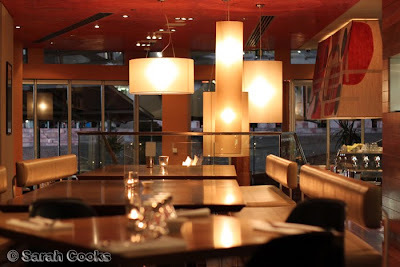 Giveaway: Arintji has offered a $75 meal voucher to give away to one of my readers. To enter the draw, all you need to do is leave a comment on this post, answering the question: "If you could share a meal at Arintji with anyone in the world, who would it be?" Please comment on this post by midnight on 9th September 2010 to enter. (Include your email address so I can contact you!). I will choose the winner based on the most creative response, and will announce the winner on my blog on the 10th September. My decision is final and no correspondence will be entered into! Good luck, guys! Sarah and Sandra dined as guests of Arintji. I'd share the meal with my parents. My parents have never been in a fancy restaurant before as they spent their whole life working hard so their children can have the money to live comfortably. So, I'd like to share the experience with them, because why should they miss out on some of the fancier details of life? 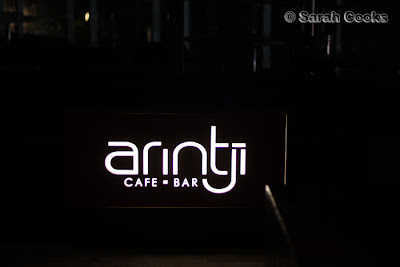 wow its such a coincidence the restaurant we are talking about is Arintji. I made a booking for this restaurant a month ago to take my partner out for his birthday. only having to cancel the booking one hour before because I had to take my son to hospital. We haven't even made it back to the restaurant, and we haven't even celebrated my partners birthday yet because of the slight hiccup at the hospital. So I would definitely take my wonderful partner to dinner at Arintji, so I can finally give him a belated birthday dinner. Looks like you guys had a good time. 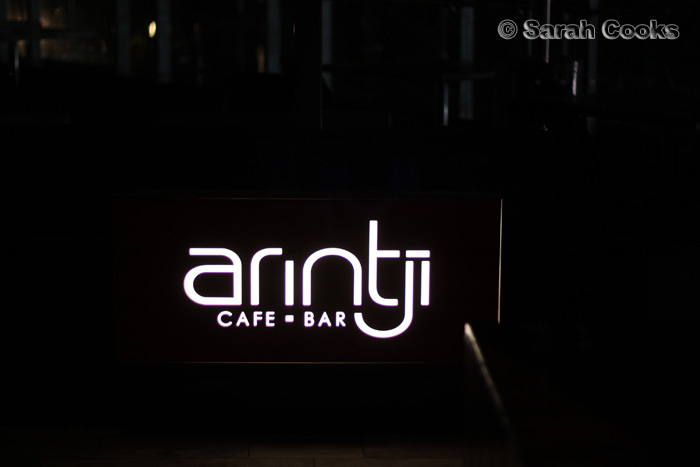 Arintji is definitely an option for any future dining out I have in the city. I'm going to think more unrealistic and definitely say Heston Blumenthal. I would ask him about how he got started in cooking and to teach himself. Also, where do his crazy ideas come from. Then I'd ask him to work some magic and turn our desserts into some other crazy thing right there and then at the restaurant. oooh how exciting a giveaway, thanks Sarah! if I could have dinner with anyone, I would choose Bob Katter because a) I would like to bend his ear about the hung parliament situation and b) I think it would be hilarious!! I would share the meal with, Graham Elliot who is an uprising American chef and I would like to find out if he has always been that fat in his entire life, whether his voice ever broke, how does he plate with his fat fingers... or on a more serious note, what exactly have entailed in his journey to becoming one of American's best chefs. He's actually quite cute :-b haha.